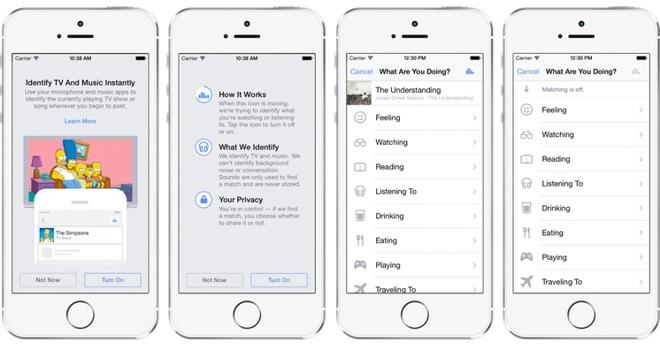 Facebook on Wednesday launched a new, optional feature that allows its iPhone application to use the device's microphone to listen for and identify television and music content when posting a status update. To utilize the new listening option, users can begin to create a status update, then click the "mood" icon. The app will then begin listening to identify any content playing, and users can then select the song or TV show to quickly share it with their friend. Facebook says that none of the sound data is saved, and users are given the choice whether to share with their friends once content is identified. The update will also allow friends to hear a 30-second preview of a song once it has been posted to Facebook, while television matches will detail the specific season and episode being viewed. Such capabilities have been present in iOS applications for years, but Wednesday's update marks the first time that Facebook has entered the fray. One of the most well known sound identification applications is Shazam, which Apple is rumored to be partnering with for a new Siri "Song ID" feature in iOS 8.